We aim to cater for the needs of all our visitors. The following statement is a summary of our provision. 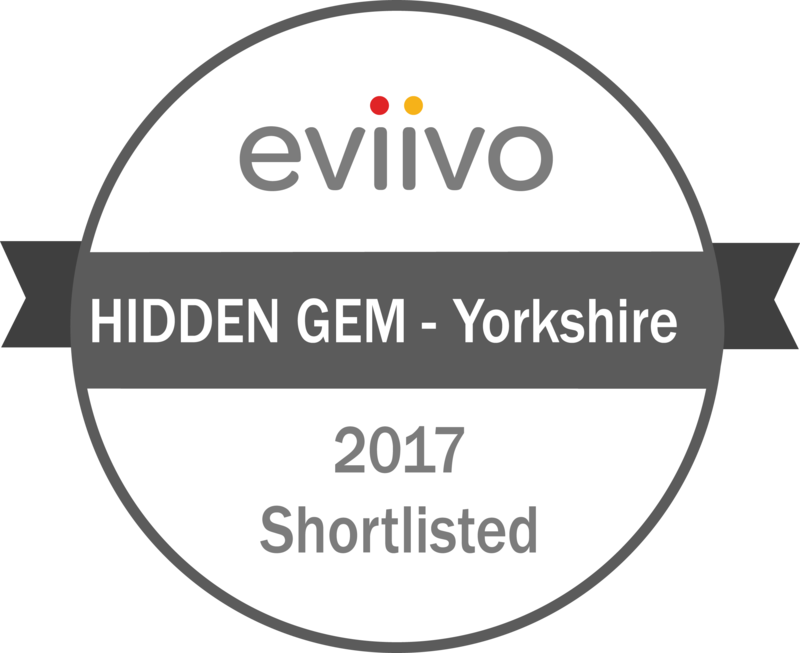 If you have any specific questions or problems please feel free to contact us and we will endeavour to help. Owing to the age and style of the property we are not wheelchair accessible. -The train station is a 10 minute walk away. If you have heavy luggage it is advisable to take a taxi. - The local taxi telephone number is 01947 600606. -On arrival to the property there is on street parking which requires a parking permit we provide this free of charge and we advise you collect this and place in your car straightaway on arrival. This permit is valid for all “W” parking zones outside the house and on the streets around us. There are also several car parks nearby, within 10 mins walk. -We assist guests with luggage. -The town is a few minutes’ walk from the bed and breakfast, as is the beach, sea, pavilion and leisure centre. -There are steps to the front door, 6 at 15cm and 1 at 18cm. -There is a bell to the right of the front door which is usually open. You will need to ring for access through the second door. -The wooden hallway floor is uncarpeted and there is a console table to rest on to complete the registration form. 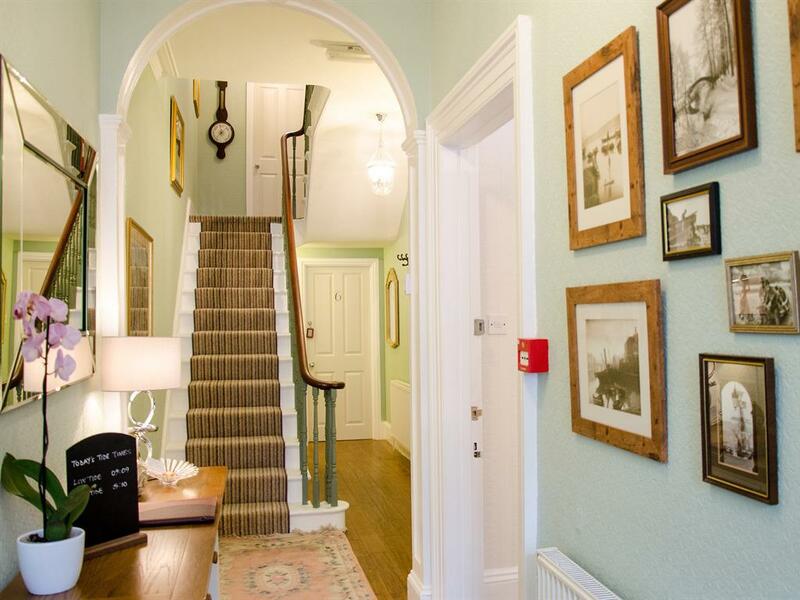 -From the hall on the ground floor, the dining room is on the right hand side, along the hallway is the ground floor bedroom No 6. -Stairs rise to the bedrooms on the upper floors, the stairs and landings are covered with short pile carpet. -Breakfast is served from 8.30am to 9.00am, in the dining room on the ground floor. -There are individual tables for each room. -Chairs are upholstered high backs with no arms. -Starters are self-serve although assistance can be given. 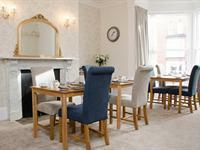 -Hot drinks and cooked breakfasts are waiter served. -The floor has short pile carpeting. -There are 6 bedrooms, 1 on the ground floor, 1 on the first floor, 2 on the second floor, and 2 on the third floor. -Ground floor bedroom 6 has a shower within the room and an en-suite cloakroom, wall mounted flat screen free view TV with remote control, short pile carpet, a single bed, bed height 54cm. 1 high backed chair, 1 bedside table with lamp. From the ground floor there are 13 stairs to the first half landing which turns to a further 5 stairs. -Bedroom 1 which has an en-suite shower room, short pile carpet, wall mounted flat screen 32” free view TV television with remote control, 1 high backed chair without arms, 1 low tub chair, two bedside tables with lamps. The bed is standard double size, bed height 59cm. 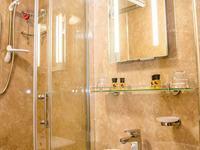 -En-suite rooms do vary in size but the majority are spacious. - All have anti-slip vinyl flooring. -Thick cotton bath mats are provided. -There is a small garden to the front of the property with a seating area for guests to use, 2 large benches and 2 low back chairs with arms. -To the rear of the property is a private enclosed yard where we are happy to store motor bikes and cycles (by prior arrangement). A totally NON SMOKING policy exists within the house. 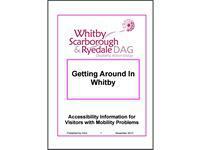 Whitby Disability Action Group have compiled a directory of Accessibility Information for Visitors with Mobility Problems. Good accommodation in handy locale. Welcome refreshments on arrival. Helpful arranged parking . Breakfast offered good choice, nicely presented. .